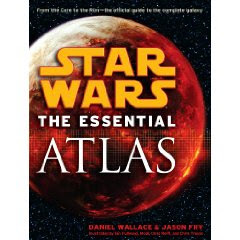 I understand the Star Wars Atlas by Daniel Wallace and Jason Fry releases this week; I got an early peek from publisher Del Rey and have to say it's an amazing book. They sought input from lots of people working in the Expanded Universe, and readers of my own work on Knights of the Old Republic and Lost Tribe of the Sith will find a number of places where we compared notes. The big one touching on the comics, of course, is the Mandalorian Wars map, which inlcudes all the major settings for the comics series so far an some yet to come. But we also get locations for Kesh and a better look at how the Hyperspace War-era Sith Empire looked — including a pretty good cartographical reason for how such a sizable and active community would have been in Shangri-La territory as far as the Republic was concerned. Readers know that when it comes to source material in places like the Campaign Guide I contributed to, I'm a fan of explanations that don't close story doors unnecessarily — and the authors on the Atlas worked really hard in that regard to provide explanations that worked with everything. Recommended — I know I'll be using this a lot. Maybe I should put mine in a three-ring binder? Thanks John! The Atlas wouldn't have been as strong without your contributions.